I always have mixed feelings about Explorer – Windows native file manager. For all interface decisions, standard experience and many years of development it is still unfitting for anything but basic tasks. There are numerous apps that try to improve Explorer via toolbars and other interface extensions. Q-Dir goes further by incorporating Explorer windows in its interface. 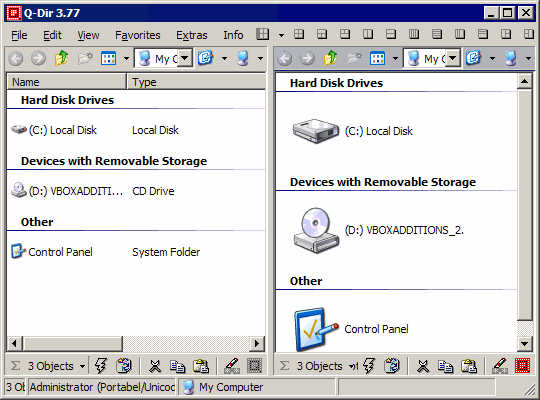 Simply put Q-Dir combines several (1-4) Explorer windows in single interface and surrounds with some nifty additional functions. There is large number of different layouts that can be quickly chosen with buttons in toolbar. There is also interesting option to save current layout and paths into file on desktop. Other customizations like color schemes and tweaks for some interface elements are available. But on inside it functions and feels exactly like Explorer. completely ignores classic dual-pane paradigm even if some layouts look close. This makes it very fast, responsive and zeroes learning curve. On other hand it is extremely mouse-driven (as is Explorer) and oblivious to polished and efficient hotkeys of dual-pane file managers. Q-Dir is freeware that is probably best fit for users that find Explorer no longer sufficient but have no background, resolve or need to move into realm of more powerful solutions. With tiny size, light resource footprint and native portable option it is also good to carry on flash drive or quickly fetch from Internet. Been using this app for a couple of months now and I really love it. * you can also start a CMD window in the patch that you are currently in, which is a BIG plus for me (by clicking on the little lightning bolt that you can see in your screenshot). Great timesaver. * it has many many other functionnality that I will not start to tell here, try it out for yourself! Finally, I am using FolderGuide, and they work beautifully together, which is a winning combination to me! I won’t move to Q-Dir as main file manager (dual-pane is burned to deep into my brain) but it’s good option on the go or to recommend to someone who needs simple to use file manager. UltraExplorer is great too – has multiple tabs. Check it out. Can it be set to what I am used to ? Treeview on the left, and Listview on the right. I will then of course use Tabs. Yep, you can easily set it up like that. Enable tree, switch to single pane. Usual Ctrl + T shortcut for new tab (there are couple more tab-related shortcuts, see Edit menu). By Trial and error, I ended up with what I wanted. I needed that change to get it to remember the Tabs from previous session. If you knew what I went through to get the View that I wanted (aka ‘I hate Panes’), you would know how brave it was to click that ‘Use Last View’ in that same menu. So just in case my PC dies, and I have to set it up again (to the ‘I hate Panes’ view), could you restate what you have described, in terms of which Menus (etc) to click ? Layout of panes is most easily controlled by that long row of buttons at the top. Leftmost toggles tree, rest – amount and configuration of panes. You can hover cursor on buttons to get a hint what they do.